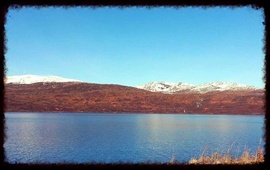 Krutvatnet with a snowy Krutfjellet in the background. 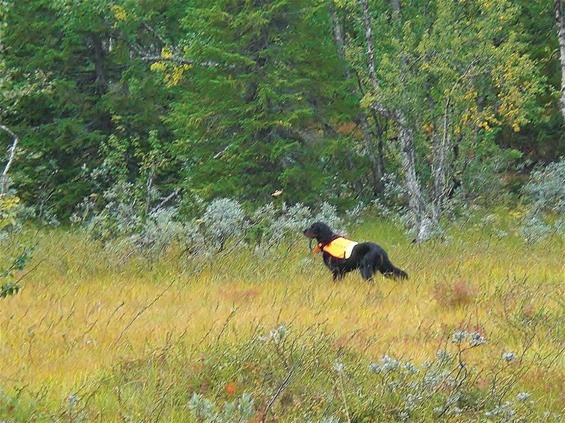 Mr.X has stand on a grouse litters when we were hunting in Sweden !! There is much work with puppies ... BUT then you come to a point where all toil is forgotten, and most of it is fun and exciting .... Ixon think in any case that EVERYTHING is exciting ... . 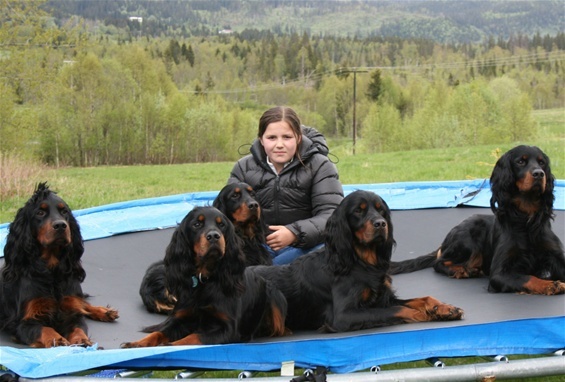 WELCOME TO THE KENNEL KRUTVATNET. This is us. . . . .
Elin, Geir, Stine Renate, Kennet, Mr.X, Gangster, Ailo and Ixon. We are a family of 5 two-legged and 4 four-legged. 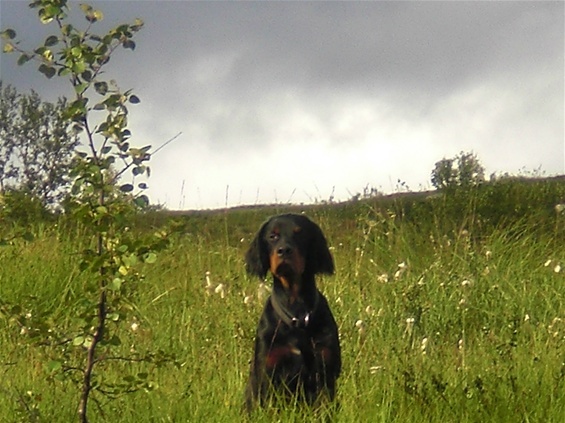 We are called Elin and Geir, Kennet, Stine Renate, Svartvatnets Mr.X, Itzas Gangster, Majahaugens Ailo X-son and Aaens I X-son. 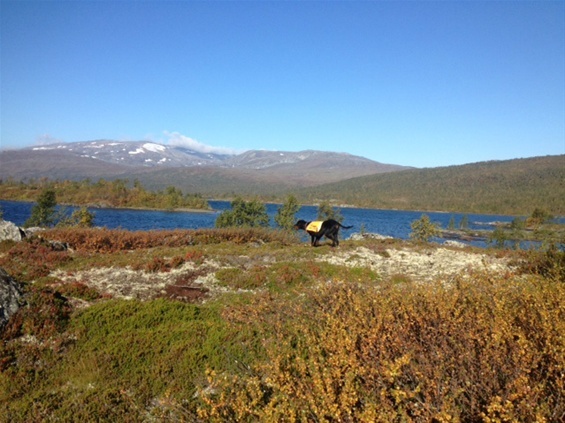 We live in the countryside about a mil north of Mosjøen. 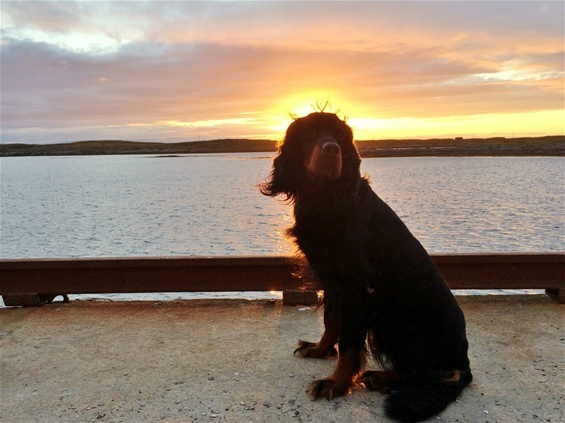 Elin was born and raised here, and Geir is originally from Steinkjer. 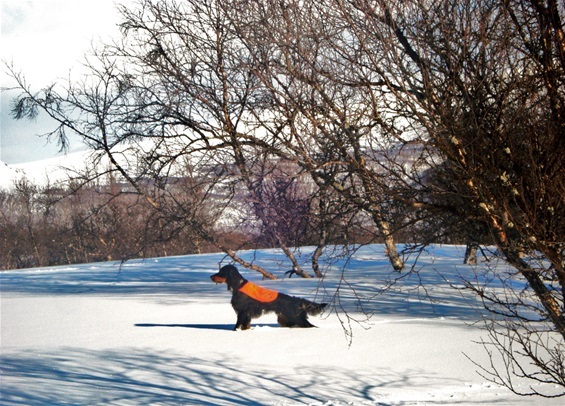 We are very fond of animals and nature, hunting and fishing, so it fits well to have our handsome Gordon Setter that we can go out in the mouantain with. 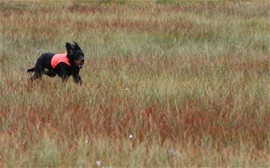 We are also participating in hunting trials with our dogs, and Geir is also a judge here. 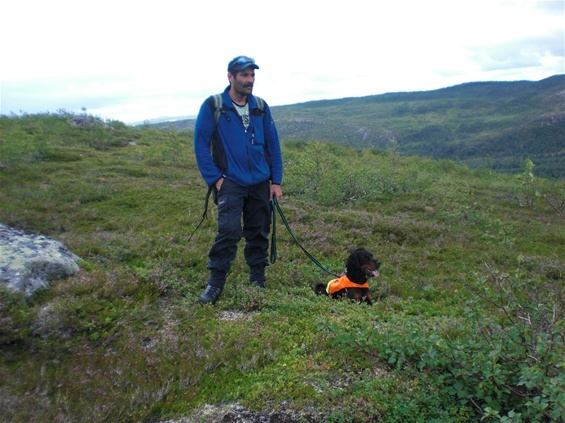 We are active in trial arrange in VefsnJFF and Geir has assumed the chairmanship for one year in birddog group. 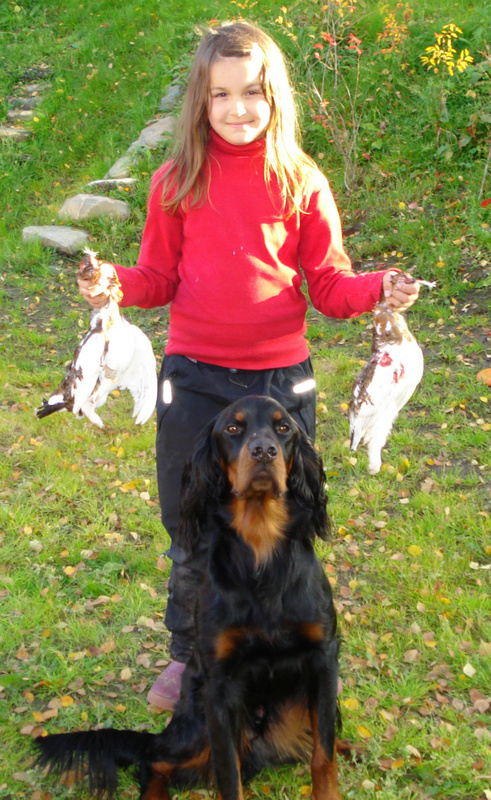 We had birddogs together since 1999 when we got Turbo, but Geir had some dogs before that ... We started with English setters, but eventually went over to Gordon setters. Geir is general Manager/owner of a trucking company called MG BIL A/S and Elin are now employed in MG BIL A/S after working in daycare for many years. 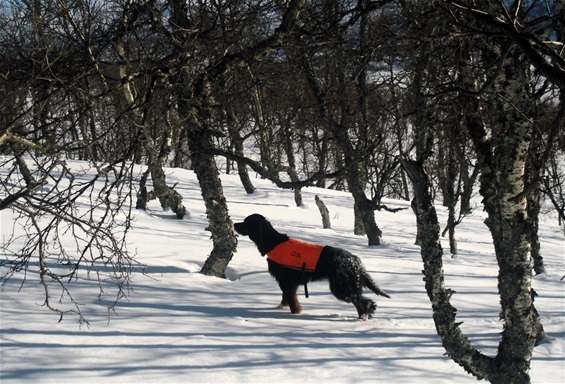 Kennet live in Lillehammer, Stine is 10th grade and Renate runs in 7th grade. 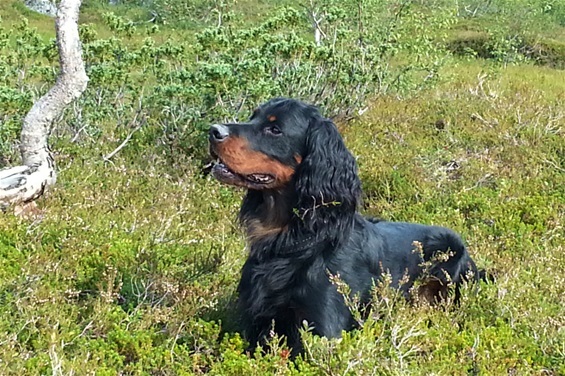 In memory of Finn Johansen and his dogs can be read about on the page "GRANESKOGEN"
Member of Norwegian Gordon Setter Klub. 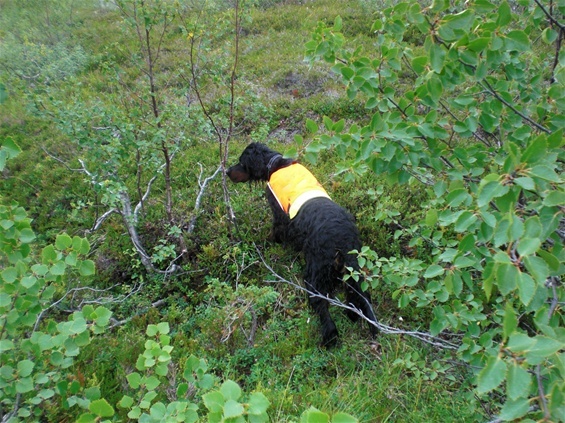 01/08/14 August is once again come and we are counting grouses. 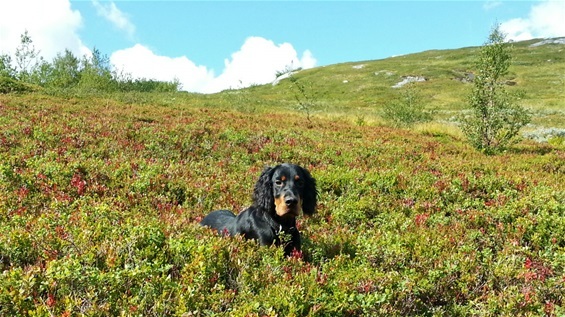 Geir and Zamba.